Posted on 18 December 2013 18 December 2013 Author MichelleCategories Celebrities, Clothing, Events & Festivals, Hair, Vintage PhotosTags 1920s, 1930s, 1930s Christmas, 1950s, ChristmasLeave a comment on A very vintage Christmas! 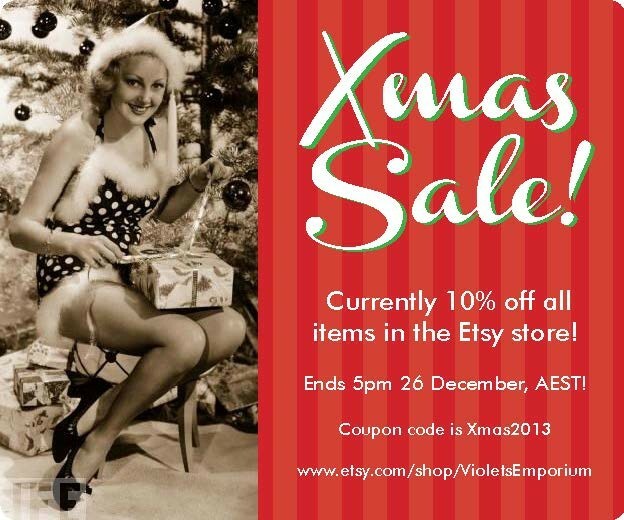 10% off Xmas Sale at Violet’s Vintage Emporium! Hi all, have a 10% off sale for Xmas in my Etsy store. The sale runs til December 26, 2013 and the discount is for all items. The code is XMAS2013 for those interested. Happy looking and have a a great Xmas!! Posted on 18 December 2013 18 December 2013 Author MichelleCategories Books, Clothing, Hats, ShoesTags Christmas, Etsy, Vintage Christmas, Vintage sale, Violet's Vintage EmporiumLeave a comment on 10% off Xmas Sale at Violet’s Vintage Emporium! I just wanted to wish our readers all the best for the holiday season and a wonderful New Year! And I will have lot’s more vintage goodness for you in 2013!! Posted on 23 December 2012 23 December 2012 Author MichelleCategories Celebrities, Events & Festivals, Vintage PhotosTags Carol Lombarde, Christmas2 Comments on Merry Christmas to all! Just a wee note from me for the holidays. Look forward to writing more articles and sharing my love of all things vintage with you in 2012. Have a safe Christmas and a Happy New Year! Posted on 25 December 2011 17 March 2017 Author MichelleCategories HolidaysTags 1930s, ChristmasLeave a comment on Merry Christmas! Just because it’s the festive season…and these are all so lovely. The 1st Carole Lombard pic (2nd row right) is simply stunning. Can you guess who the first lovely lady is? It’s Lucille Ball.